Before the Leonidas 2nd Anniversary Party, Jacky and I went to Steamworks Brewery Company for an early dinner. When we went in, the waitress stopped us and asked “You guys are 19 right?” …yes I am 19, and so is he. Thanks for the compliment, or not? We got a table at the sofa area with the high tables behind us. Jacky didn’t like how squished he felt so we moved to another two seater next to the stairs. Steamworks is a classy dimmed light pub with tall windows overlooking North Vancouver, and bold mahogany tones all over the interior. I think this place would be good for both dates with your other half and beer nights with your friends. Steamworks has been using steam powered brewing since 1995 and they are the only steam generated brewery in Canada. Their beers include Pumpkin, Wheat, Blitzen, Saison, Pilsner, Pale Ale and Oatmeal Stout. I wanted something “light” before the Leonidas party so I ordered the “Steak and Stilton Salad (CAD16.99)”. 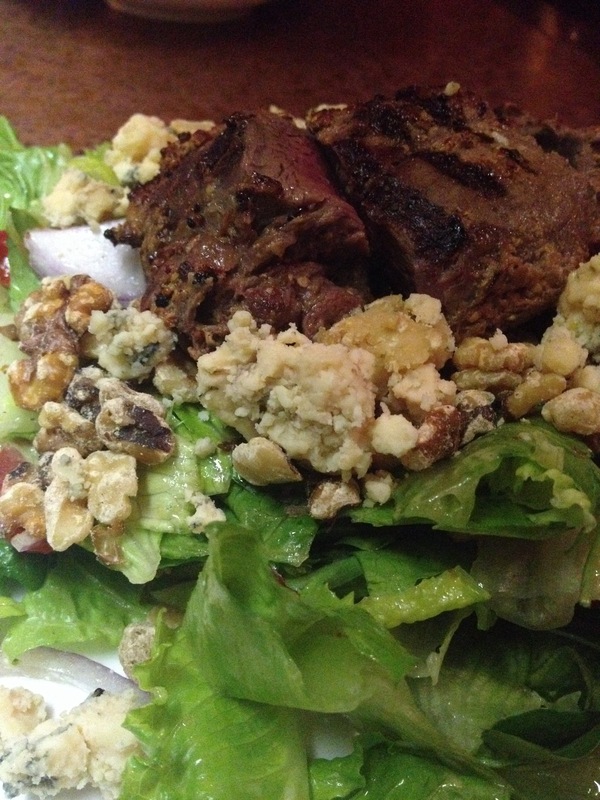 The portion was huge for me and it included red onions, cherry tomatoes, crispy romaine lettuce, watercrest, stilton cheese, walnuts, honey dijon dressing and a filling piece of dijon marinated sirloin grilled to medium rare. Maybe because I am Chinese but I don’t like certain types of strong cheese. I actually didn’t know what stilton was before I ordered and I didn’t like the strong sharp taste of it. However the salad was delicious, aromatic and just the perfect type of filling before the event. I wanted to order this but since I was worried that it was going to be too heavy, Jacky went with it. 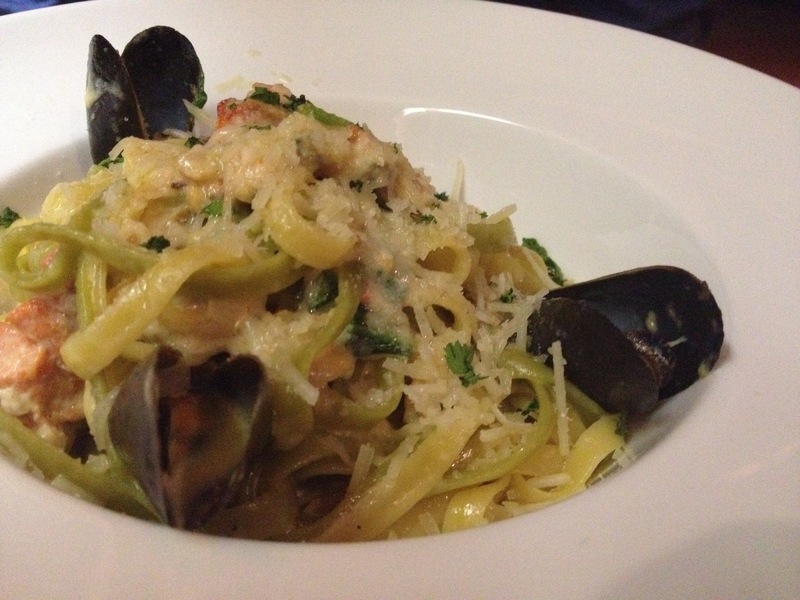 Here we have the “Seafood Fettuccine (CAD18.99)” with mussels, salmon, prawns, clams, spinach, cherry tomatoes and fettuccine tossed in a creamy and rich lobster sauce. I loved everything about this dish and the sauce was an A+ for me. Seafood lovers must try this.